Roxana Saberi On Her Imprisonment In Iran In her first in-depth interview, Roxana Saberi, who spent four months in an Iranian prison, talks about the events leading to her arrest, why she gave a false confession to the Iranian authorities that she was a spy, and what ultimately kept her going. In an in-depth interview with NPR, Roxana Saberi says she made a false confession to her Iranian interrogators that she was a U.S. spy in hopes that she would be freed. She says her confession was made under psychological duress and she soon recanted because her "conscience got the better" of her. May 22 — Saberi returns to the U.S. In June 2004, Roxana Saberi filmed a ceremony on the southern outskirts of Tehran that marked the 15th anniversary of the death of Iran's supreme leader Ayatollah Ruhollah Khomeini. To this day, Saberi says she does not know why she was arrested in January 2009 and forced to spend four months in prison. Journalist Roxana Saberi, who spent four months in an Iranian prison, returned to the United States on May 22. Until now, she has not spoken to the media at length about her ordeal, during which she says she faced "severe psychological and mental pressure" to confess to being a spy. 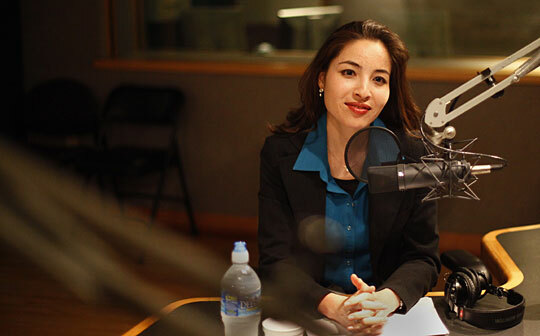 In her first in-depth interview, Saberi tells NPR about the events that led to her arrest on Jan. 31, her four months in a Tehran prison, why she gave a false confession, and her take on evidence that was used against her that resulted in a speedy trial on April 13. Saberi, who lived in Iran for six years and reported for NPR among other news organizations, was sentenced to eight years in prison by an Iranian court. In a turn of events, Saberi was freed May 11 after her sentence was reduced to a suspended two-year term. She tells NPR that to this day she doesn't know why she was arrested — or why she was freed. Melissa Block: Let me take you back to Jan. 31, when you were arrested. Where were you and what happened? What were you thinking at the time? Roxana Saberi: I was in my home on Jan. 31, when, at 9 o'clock in the morning, four men from the Intelligence Ministry came to my home. They confiscated my computers and a number of my documents and books, and then they took me to another building for interrogation. None of my neighbors saw me being arrested or taken away, and I wasn't allowed to tell anybody where I was. And it was how long before you were able to call your parents in North Dakota? Well, first of all, I should explain, I was taken to Evin prison that first evening because I was told that if I don't cooperate, if I don't confess to being a spy, that I would be taken to Evin that evening. And because I did not want to make a false confession and say that I was a spy, they took me to Evin prison that evening. I was allowed to call my parents about 11 days later, after I told my interrogators, "Please let me call my father, at least, to let him know that I'm alive." And they forced me to tell him a lie — to tell him that I didn't know where I was and that I had been arrested for alcohol, but these were not true. For buying a bottle of wine, is what you told him. Yes, and this is where the rumor began, but there's no reality to this lie. And you knew, then, from the very beginning, based on what they had told you, what they confiscated, that you were facing very serious charges of espionage here. Until this day, I'm still not sure what they arrested me for. It wasn't for buying alcohol; it wasn't for reporting without a press pass. My interrogators claimed that I was spying for the U.S., and however much I told them that I was not — that I was simply writing a book and doing interviews for a book, which I hoped to use to show English speakers around the world a more balanced and complete picture of Iranian society — however much I told them this, they told me I was lying and that I was a U.S. spy. So my first — the first charge that was against me was taking steps against national security, which can mean various things in Iran. I interviewed your father back in April, while you were still in prison, and he told me that you had made statements under pressure — under threat — while you were being held in Evin prison. Was that the case, and if that was the case, what did you confess to under duress? That was the case. As has been seen in the past, one of the ways that people get out of these kinds of situations is to make a confession, and even be videotaped making this confession, even if this confession is false. And so, under pressure, I did the same thing. After I realized that nobody knew where I was, I was very afraid, and my interrogators threatened me and said, "If you don't confess to being a U.S. spy, you could be here for many years — 10 years or 20 years, or you could even face execution." And I thought, well, if something happens to me, my family doesn't know where I am, maybe they would never find out. And so I made a false confession and I said, "Yes, I'm a U.S. spy." But because my conscience got the better of me and the God that I believe in — the God that I thought had abandoned me when I was first in prison — I realized [he] was always with me. And I realized that he was not pleased with what I had done by making this false confession. I recanted my confession, knowing full well that I would jeopardize my freedom. And indeed, that's what happened: The prosecutor got upset with me for recanting my confession and sent my case to trial instead of freeing me, and that's when I was sentenced to eight years in prison. I knew this was going to happen when I recanted my confession, but I told myself, I would rather tell the truth and stay in prison instead of telling lies to be free. And I didn't want to set an example for people to come after me, that they have to give confessions in order to be free. Because even if you become free after telling lies, I felt, my conscience would always remain behind bars. Let me take you back just a bit to those interrogations in Evin prison. Can you describe what that was like? Was there any physical threat? Was it purely psychological threat? I was under severe psychological and mental pressure, although I was not physically tortured. The first few days, I was interrogated for several hours, from morning until evening, blindfolded, facing a wall, by up to four men, and threatened, as I said, that I would be put in prison for 10 to 20 years or more or even face execution. And I was in solitary confinement for several days. The really difficult thing was they didn't let me tell anyone where I was. I never told anybody where I was. When I called my parents for the first time, my interrogators pressured me to tell my parents that I didn't know where I was, [that] I was somewhere in Tehran, but I didn't know where and that I had been detained for buying alcohol but that I would be freed in a few days. And they asked me to tell my parents, "Don't tell the media; don't announce it." They told me, "If your parents talk about it in the media, we won't free you." I later found out that the person who became my first attorney had gone to Evin prison and asked if I was there and was told no. So it took a long time for them to find out where I was. They would have assumed, though, that if you were facing such serious charges, that is likely where you would have been taken? Right, but they thought I had been arrested for alcohol. And actually, I wasn't even supposed to tell them I was somewhere in Tehran — I told them that myself. And I tried to give them the hint that I was lying to them, but they didn't understand, unfortunately. I said something like, "Tell Mom I'm sorry I missed grandfather's birthday." My grandfather had died a few years ago. But I think they were just so stressed they didn't understand that. I think the way that they found out in the end was that, after the news broke that I had been arrested, one of the Iranian officials himself announced that I was in Evin prison. And that's how they could confirm where I was. This was several weeks after my arrest. You had a very quick, closed-door trial in Iran's revolutionary court. When that sentence came down — eight years — what were you thinking? What was your reaction? Actually, I thanked God, because I knew that if I had been handed only one to two years, that there wouldn't be such an international outcry. But the eight years seemed so ridiculous, and I realized, after this sentencing, that it's true that when you — sometimes, or at least in my case — if I had told a lie, I would have been freed. But since I told the truth, I was being punished by staying in jail. And so that's when I felt I was justified to start my hunger strike. And tell me about that. I basically drank just water with sugar, except for the few last days when I cut out the sugar and I was just drinking water for a total of about two weeks. The first two or three days were difficult, but after that, it got better. And toward the end, my blood pressure fell and they hooked me up to the IV. In the end, I decided to stop. What made you decide to stop? She would start her own hunger strike? Yes, I was very worried about her. And I knew she's as stubborn as me and she would do it. And also, I'd heard that there were a number of people going on hunger strikes around the world for me and they had asked me to stop, but that they would continue. And so I told my parents, "OK, I'll stop now, but if the appellate court gives me an unfair sentence, then I'm going to start and I'm going to continue on until the end." How did you hear about what was going on either with your mother or with other hunger strikes around the world? After my parents came to Iran in early April, I was able to see them once a week and talk to them by phone once a week, always with a minder. And so they tried to keep me up to date as best they could. So you got a little information through them. I got a little information. And I have to say that the things that they were telling me truly gave me strength and hope and I didn't feel alone anymore. Roxana, there's been a lot of confusion — maybe some misinformation — about what evidence was used against you, and maybe we can try to clear some of that up. One of your defense attorneys, Saleh Nikbakht, said after your release that part of the evidence against you was that you had a document about the U.S. invasion of Iraq that you had copied while you were working as a translator for a powerful council within Iran's clerical government. How did you get this document? What was that about? Well, I have to clarify a number of things that you just said. The Iranian government claimed that I had a classified document, but I don't think it was classified. This is Iran and it's not a very transparent system, and some things that authorities say are not always true. The document did not have a classified stamp on it, which I've heard such documents are supposed to have, and it was not clearly identifiable as classified. It was an old document from 2002 and it didn't contain any information that had not been stated publicly several times before. They also didn't even know about it at the time of my arrest. They didn't know about it until I brought it to their attention. You brought it to their attention? Yes, because they pressured me to confess that I had classified documents and I didn't have any, but I started describing the documents that I did have. And so, later, they brought me to my home and I gave them the ones that they didn't already have. But when I gave them this one, I looked at it and I said, "See, there's no classified stamp on it; it's not classified." Why did you have this document in the first place? How did you come to have that in your house? I obtained it at a governmental think tank. Describe that a little bit — what were the circumstances? I was editing English grammar of a few academic articles for publication on the Web site of the Center for Strategic Research, which is a governmental think tank. And you wanted to know how I got it? Yeah, and so how did the document come to you? So I copied that document. Was it a document you were translating? So what was it about it that made you want to have that? It was — you know, I'm a naturally curious person, and in hindsight, I shouldn't have copied it, but it wasn't classified, as far as I could tell. I wanted it for historical perspective, because I knew it was an old document. And I didn't go about it in devious ways at all. I want to clarify one other thing: This defense attorney had described your work as being for a clerical council that advises Iran's supreme religious leader. Was that also work you were doing, separate from the work you're describing with the think tank? He said that I was translating articles? He said you were working, I believe, as a translator for the Expediency Council. -- for any council that advised the Iranian government? No. I was just editing the English grammar of a few of these academic articles for publication for the Web site of the Center for Strategic Research, which is a governmental think tank. Some of the research that this think tank does goes to the Expediency Council, but I was working on those articles that were to be publicized on their Web site or for journals in the West. There's another thing that we should clear up here, and that's a statement made from the same defense attorney, Mr. Nikbakht, who has — he disclosed an allegation that you had met with someone who he said was named Mr. Peterson who worked for the CIA, and according to the defense attorney, this man tried to recruit you. Did you have any conversations with anyone who claimed to be working for the CIA, and who may have tried to recruit you? So where is that coming from? I have to say, first of all, that — about this document — in court, both my attorneys argued that it was not classified. So I can't assess why Mr. Nikbakht is saying now that it is. A lot of the things he has said since my release have been either incomplete or untrue, and I don't know why it is — maybe they believe whatever the court has told them or maybe it's because they live and work in Iran and they have to be careful of their relations with the authorities. In Iran, there have been, even, attorneys who have been jailed for representing clients with sensitive cases, such as mine. He may have been referring to the false confession I made, but that was — my confession was false and I thought I had to fabricate it to save myself. So I don't want to really say any more about this person, because it was false. So the name and the — I mean, there's a fair amount of specificity in what he was saying here, this name, Mr. Peterson, [was] invented out of whole cloth? Was this part of the government evidence and you're now saying it's absolutely not true? I don't really want to say any more about this person because it was completely false and I recanted it before my first trial. Recanted it while you were still in prison before you came to trial? There was also some question of whether trips that you had made to Israel may have raised the suspicion of Iranian authorities. Do you think that may have been part of what they were presenting as evidence against you? No, and it was never a charge against me. Did they raise it in your questioning? They raised many things. I think they, overall, had a paranoia about me and other people like me, because they knew I was also American, they knew I was a journalist, they knew that I could go and come from Iran to America. They are generally — they at least show themselves to be — very suspicious of people who have contact with the outside world. Did it surprise you when they were interrogating you how much they seemed to know about you, or how much misinformation they had gathered against you? I realized that they had been monitoring me for at least a few years — my phone calls and my e-mails. They had some information about me, but it wasn't complete. Had you had a sense before that that you were being monitored, that your phone calls weren't safe, your e-mail wasn't safe? I think most foreign journalists who are in Iran think about it sometimes, but I never really dwelled on it. I never really felt that they would have been monitoring me. Maybe when I was a journalist, it would have been more natural for them to. Your press credentials to work in Iran were revoked or expired, I believe, back in 2006, but you did continue to do reporting, including for NPR. Do you think, in hindsight, that that was a risky thing to do? As far as I know, it's not a charge under Iranian law to work without a press pass. Do most journalists who are working there have a valid press credential? If you want to go to official meetings — governmental meetings — you should have one. And what about for the kind of work you were doing? As far as I know, I wasn't illegal, because I wasn't going to government or official meetings. Would it have given you any added protection, do you think, to have had that? This was also not one of the charges against me, so I can't say. No, it was never a charge, it was never a charge. The only charge against me was acting against national security. So that was misreporting at the time? It was something that one of the officials said there, which was, like many things they said about me, untrue. Tell me, you were in captivity — held in Iran for 100 days. Tell me about those days in Evin prison: What filled your time, what you thought about, what kept you going? Well, when I was in solitary confinement was probably the most difficult time for me. And I prayed a lot — I prayed more than I ever have in my whole life. At first, I used to worry a lot about my parents not knowing where I was. At first, I just felt very afraid. But then I realized that I need to turn this challenge into an opportunity, and maybe this challenge can make me stronger, mentally and spiritually. And when I made the false confession, after that, I realized that I had made a mistake and I needed to try to right my wrongs, even if it meant that I would suffer. As long as I did the right thing, in the long run, in the end, I would be victorious. This was one of the lessons I learned there. And also, I learned that maybe other people can hurt my body, maybe they could imprison me, but I did not need to fear those who hurt my body, because they could not hurt my soul, unless I let them. So I think these experiences, they taught me a lot and I learned a lot from the other political prisoners there, too — the other women — because after several weeks, I was put into a cell with them. Many of those women were there because they are standing up for human rights or the freedom of belief or expression. Many of them are still there today; they don't enjoy the kind of international support that I did. And they're not willing to give in to pressures to make false confessions or to sign off to commitments not to take part in their activities once they're released; they would rather stay in prison and stand up for those principles that they believe in. What were those conversations like? They gave me a lot of inspiration. I learned a lot from those women. I think they're some of the most admirable women I've met, not only in Iran, but all over the world. I shared a cell with Silva Harotonian, who is a researcher of health issues, and she's been sentenced to three years in prison. I also shared a cell with university students, Baha'is — [a] wide range of women. The researcher you mentioned just now was working, I believe, for an American NGO. Her case has gotten very little attention here. It has. I'm not sure, because I was in prison and I didn't know about her before I was in prison. I can't say much about it. Did these women — the political prisoners — what did they tell you to sort of keep you going or make you stronger in prison? They said you should stand up for what you believe in, even if it means that you will have to stay in prison for a long time. They said, "Tell the truth, even if you have to suffer for it." When I interviewed your father back in April, he said you had a list of books that you wanted him to bring to you. And did you ever get a chance to get those books? Were you doing any reading? Those are long months to fill. Yes, after several weeks, I was given some books. At first, they only had the Quran in Farsi, which was, for me, hard to understand, because my Farsi was not that good yet. He brought me some books that I wanted — Will Durant and a book about Gandhi, and also, the Bible and the Quran in English. And they gave me a lot of strength. And how else did you fill your time? What kept you going? When I was in the cells with other women — because the women changed; some would become free and some new ones would come — speaking to them and, after a while, we also got a television. It had the Iranian state-run TV. And then, every other day, we were let out for what they called exercise, but basically, we were led out into a small plot of cement, you could say. It had tall, cement walls and just the roof opened up to the outside, and we would walk around in circles for about half an hour every other day. Roxana, you've lived in Iran for some years; how do you read your release on the suspended sentence? I mean, do you see this as some sort of power play between the hard-liners in Iran and reformists? You know, it's difficult for me to speculate because I don't know, and as I said, it's not a very transparent country. But I can guess, perhaps, that if the hard-liners had their way, I would still be in prison today, especially the hard-liners in the judiciary and in the Intelligence Ministry. But the people you could maybe call more pragmatists — they seemed to reach the conclusion that it was more costly to keep me, amid all this international pressure, instead of to release me. You're heading home, now, to North Dakota? Can you imagine going back to Iran? You know, I'm proud to be an American; I'm proud to be Japanese; and I'm proud to be an Iranian. I went to Iran because I wanted to learn more about my father's native country and to learn the language. And I learned to love the country. Most of the people there were so hospitable to me, so kind and so generous. And definitely, I hope to go back someday. And you mentioned you're working on a book — or were working on a book on Iran. (Chuckles.) Yes, I was working on a book and I plan to write a book. Sounds like now it will be a pretty different book than the book you anticipated you'd be writing. Yeah, and possibly, I'll incorporate the previous book into this book, but definitely, I want to write about my experiences over the past few months. Roxana Saberi, thanks so much for coming in.